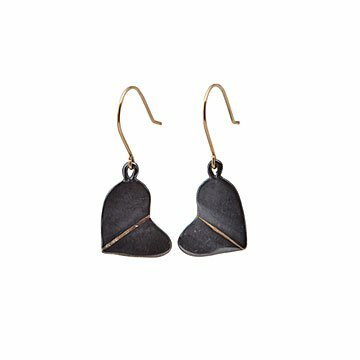 Emilie Shapiro crafts these beautiful earrings by "breaking" silver hearts and mending them with gold. Kintsugi or "golden joinery" is the Japanese tradition of using gold to mend broken pottery. It leaves the renewed piece stronger and more beautiful than it was before. Emilie Shapiro uses a similar technique to form her sterling silver heart earrings. First, she cuts the slightly askew designs from silver sheets, then she "breaks" each shape by cutting it in half. By adding gold fill to reconnect the halves, Emilie creates hearts imbued with more strength and beauty than the originals. "Sometimes life's challenges lead to the strongest bonds," she says. Wear these earrings to celebrate your own fortitude in the face of adversity, or give a pair to someone you're always growing closer to, even through tough times. Handmade in New York City. Pendant: .6" L x .5" H; Full Drop: 1.2"